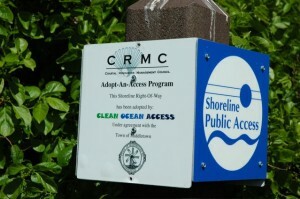 Friends of the Waterfront and Clean Ocean Access! Last night at the Friend of the Waterfront (FOW) Board Meeting we achieved approval to establish a long term collaborative effort of FOW&COA to formally adopt the seventeen (17) CRMC rights of way to the shoreline in the Newport Harbor. This is a great step for a lasting relationship for FOW/COA/CRMC and the City of Newport to protect, preserve and maintain public access to the shoreline. There are many GREAT opportunities that will come about with this initiative. Thank you to all the COA volunteers who have been monitoring access points since 2008; it is your hard work, dedication and effort that has created a program that has respect, recognition and integrity. THANK YOU! Previous PostPrevious IRS non-profit status approved!! !